The trail passes through some of the most remote and scenic portions of the Ozark Mountains, like the Hurricane Creek Wilderness Area. It also visits White Rock Mountain (best sunset in the Arkansas! ), Hare Mountain, the Marinoni Scenic Area, Dead Dog Bluff, and countless other breathtaking spots. I live in the Ozarks and over the years have hiked many a mile in the region. Late winter hikes are sometimes the best (less worry about snakes, and spectacular views through the leafless trees), but the trail is a magical place year round. And while my boots seldom hit the trails these days, I love to read the stories shared by hiking enthusiasts, photographers, and others who celebrate the wonders of the outdoors. This black lab demonstrated good outdoor skills as she curled up in a nest of leaves next to a log. The following morning we feared we were going to witness the death of this dog but she persevered and continued mile after mile with only limited rations from our small surplus of food. There’s much more to the story, and you can read it here. 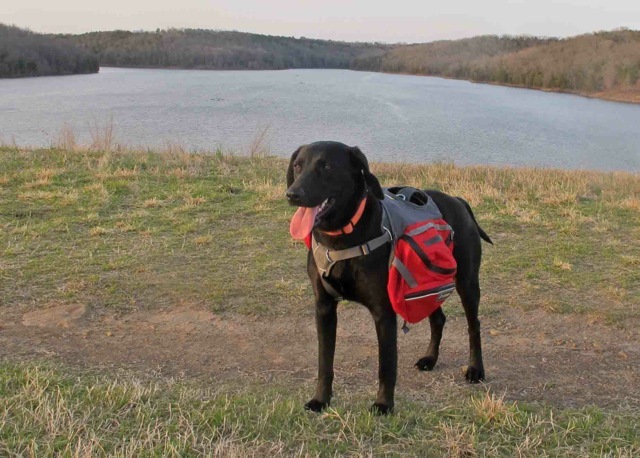 And once you’ve read how the story began, take a look at Jim’s most recent posts and learn the 12 qualities that make this dog an ideal hiking partner. Here’s a photo Jim sent along for the slideshow, showing his new partner ready for her next adventure! For more great photos and stories, view the slideshow at Jim’s blog. And then grab your boots and find a trail near you! This entry was posted in Dogs!, Ozarks and tagged Jim Warnock, Ozark Highlands Trail, Tim Ernst. Bookmark the permalink. Hiker is an amazing dog, isn’t he? Thanks for your comment!